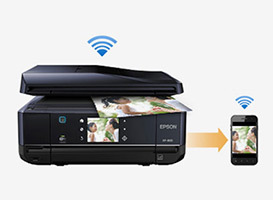 Epson's mobile and Cloud printing services allow you to print and scan wirelessly using smartphones and tablets within the home, in the office and whilst you are on the go. 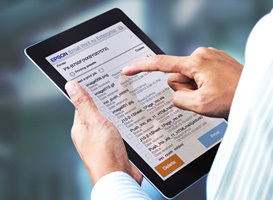 Learn about the services that Epson Connect can offer to ensure you gain the most out of your printer and smart devices. Print from the comfort of your chair, from the garden or whilst away. Wherever you are, whatever your device, Epson Connect can help. Need to stay productive while on the go? 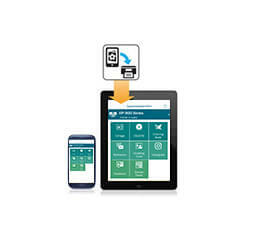 Easily print documents to the office printer from your tablet or smartphone so they arrive before you do. Have ideas brainstormed on a whiteboard? 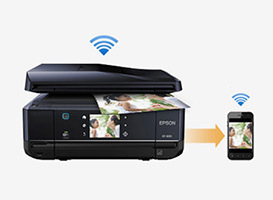 Snap a photo of it with your phone and then instantly print out copies on a nearby Epson printer. 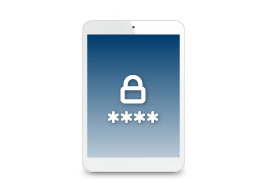 This secure printing system is driverless and seamlessly integrates into existing IT environments. 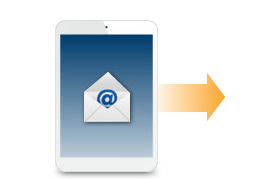 Email Print for Enterprise allows you to securely send documents directly to the printer. Available in direct printing or Pull Print mode, this secure system integrates seamlessly into your existing IT infrastructure. 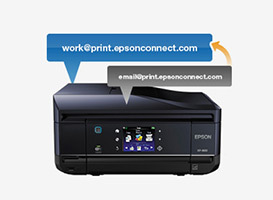 Email Print for Enterprise is compatible with Epson's business printers and with it you can print from any device that can send an email in the office. Email Print for Enterprise is available via a choice of three licence packages for a variety of company sizes. 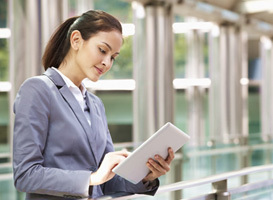 How can Email Print for Enterprise help you? 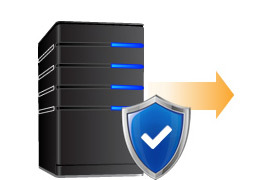 Files remain secure when printing via PCs connected to the network or mobile devices connected via Wi-Fi in the office, as they are within the company network, and therefore protected via the firewall. This server-based software system enables documents to be sent to print via email without the need for driver installation or application downloads. 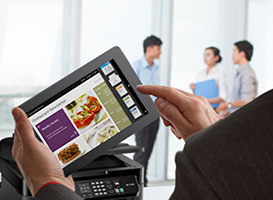 Take advantage of the mobility of using WiFi to connect to the system and still print securely, when you're within the office building. 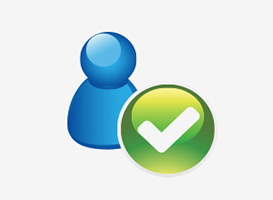 Active Directory support allows users to sign in with their current computer login details, so IT managers do not need to set up new email addresses and passwords for the system. Automatic deletion of unreleased documents after a pre-defined time, helps IT managers to reduce print costs. 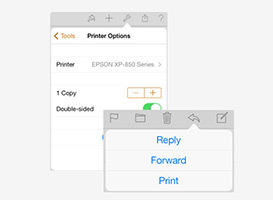 Standard push print mode offers simple send-to-print functionality. 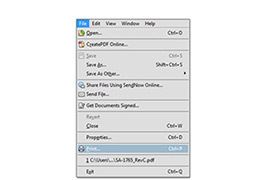 Simply send a file to the printer's email address and you can print the body of the email as well as attachments such as Microsoft Office documents, PDFs and photos. Ideal for printing highly confidential documents from your laptop, smartphone or tablet PC, or when you need to print securely and discretely from an email or attachment. 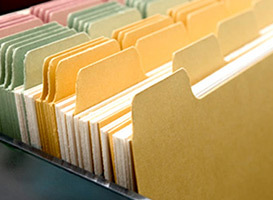 For high-level document security, pull print mode ensures pending files do not show in the print queue and requires the user to log into an intranet-based interface to release the print from the printer after sending. Send a file to the central email address, then go to the printer of your choice to release your print job after logging in via the web app on your mobile. 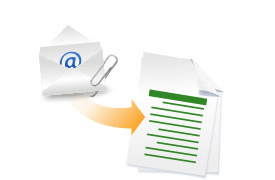 You can print the body of the email as well as attachments such as Microsoft Office documents, photos and PDFs. Select which print job you want to print, and choose which printer to send the print job to, from a list of available printers. Easily identify the pull printing device near you by printing a label with the printer name to display on the front. Then users simply select the printer name/location displayed on the label to release their print job securely to that printer. 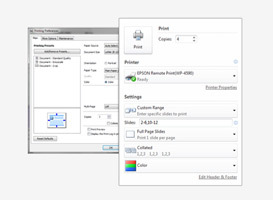 Download the pre-defined template for LW-600P and use the Epson Label Editor software to create your printer labels. Perfect for office workers, the wireless LW-600P lets you produce personalised, great looking labels quickly and easily. 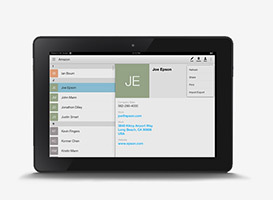 Turn your tablet or smartphone into a powerful office assistant. 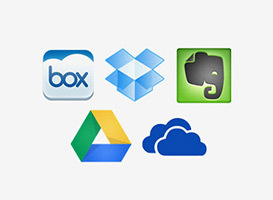 Access files from Box, DropBox, EverNote, Google Drive and Microsoft OneDrive and print them from anywhere2. 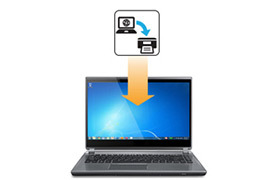 Or scan from a nearby Epson printer, then email or share your files online. 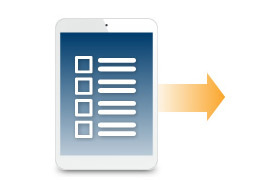 iPrint turns your mobile device into a powerful productivity tool. 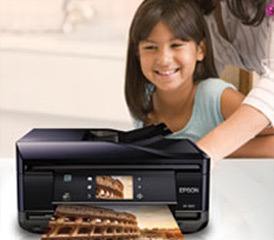 iPrint can send documents and photos directly to any email-enabled Epson printer wherever you happen to be. 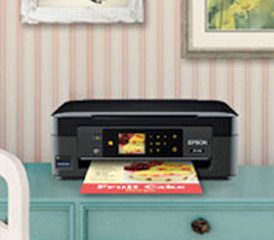 Need to print to an Epson printer that's right next to you? 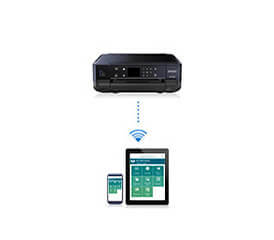 Just log your device onto the same Wi-Fi network to print. iPrint can also scan from a nearby printer via Wi-Fi. Now you can scan, save and share from your device. 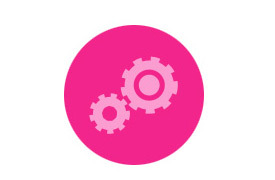 How can iPrint help you? 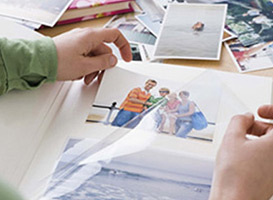 Want to save an important document or a memorable photo? 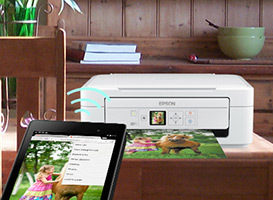 Now you can use a nearby Epson all-in-one to wirelessly scan and capture your file to a smartphone or tablet. You can then choose to email it, save it to your device or upload it to your cloud account. 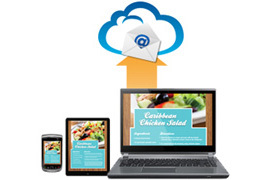 Access to the Cloud is built right into iPrint making online access easier than ever. You can log into Box, Dropbox, EverNote, Google Drive or Microsoft OneDrive so you can preview and print your files online or scan and upload them. 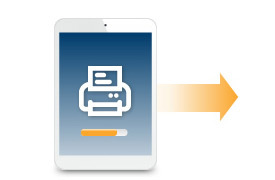 Use your printer to transfer files directly to your tablet or phone. 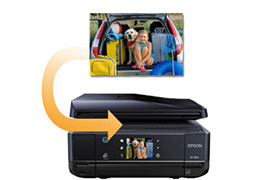 Just insert a USB drive or memory card into your printer and iPrint can see and transfer photos to your device. You can also reverse the flow and transfer files off your mobile device. 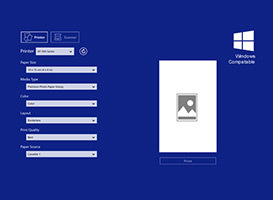 Provides a new way to transfer photos taken from older digital cameras. Photo paper support: A4, A5, A6, B5, 16:9, 4" x 6", 5" x 7" and 8" x 10"
Manual IP Function - enter a printer's unique IP address to print within complex network environments. 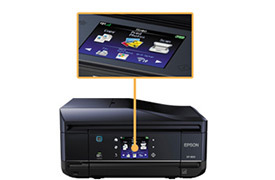 Remote Print function - print from anywhere by sending files directly to an email-enabled Epson all-in-one. Epson printers now have their own email address. Simply email photos and files to your printer from any device, anywhere. 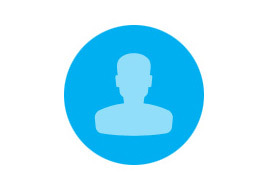 You can also change your printer's email address and turn on an "Approved Senders List" to make printing more secure. It's so easy and secure that it will change the way you print. 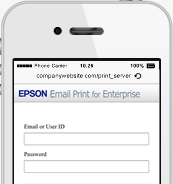 If your device can email and access the internet, you can use Epson Email Print. You'll realise how easy and convenient it is to email your Microsoft Word, Excel, PowerPoint, PDF, JPG and TIF files to print from anywhere in the world. Want to change the automatically assigned email? 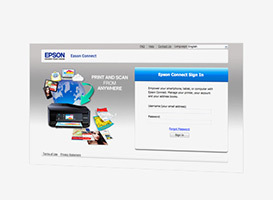 Just use your Epson Connect account to customise your printer's email address. Now it's easy to remember for you and anyone you share the printer with. Need to limit who can use your printer? Turn on the "Approved Senders List". You can then add which email account will be allowed to use your printer. You can even add an entire email domain and quickly approve an entire company's email list. 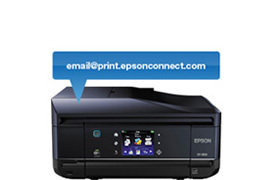 Access your Epson Connect account to quickly see your printer's status, check print logs and even suspend Email Print. You can also change your print options and set notifications. You can now take control no matter where you happen to be. Photo paper: A4, A5, A6, B5, 16:9, 4" x 6", 5" x 7" and 8" x 10"
Install Remote Print to improve both the power and reach of your computer or laptop. 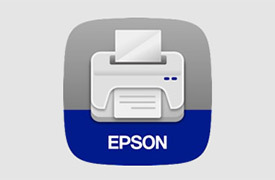 It's as simple as clicking on File/Print to send your file to an Epson printer anywhere in the world2. No need to worry about formatting or font issues. Best of all, you can access and control advanced print options. 2. Select File/Print from any application and choose "Remote Print"
Printing to a faraway printer is now as easy as File/Print. 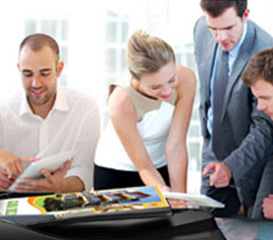 Remote Print is more powerful than faxing because you can print in colour without having to leave your desk. It's also faster than email, since you can skip saving the file as an attachment first. Use Remote Print to expand your printing horizon. Remote Print is powerful in another way - it works with any application that has a print function. If you have specialised software that your recipient doesn't, just send it to their Epson printer without having to convert to PDF. All your formatting and fonts will print perfectly. 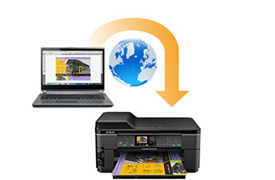 Remote Print lets you control how your output will print at a remote location. Choose number of copies, page range, reverse order and collation options. 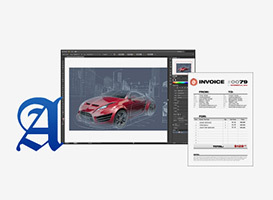 You even have access to software specific printing features to give you ultimate control. 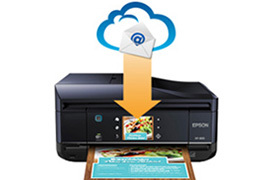 Your Epson printer now has a direct link to the Cloud. With a direct Internet connection, you can scan documents or photos with a few taps on the printer's control panel. Then share your scanned file to preset email addresses or online cloud storage accounts without the need for an attached printer. You can use cloud services to store and centralise all their documents for staff to access wherever they may be, on whatever device they may have. 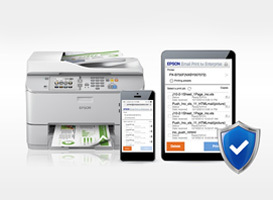 Epson Scan-to-Cloud allows you to scan, archive and share any business documents. 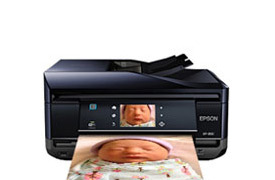 Use your printer to scan and share your document or image by emailing right from your Epson printer directly to other email addresses or any other Epson Connect printer. 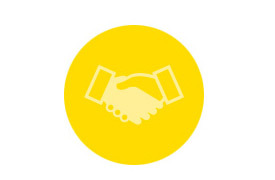 As well as Epson Connect print services, there are a number of other print solutions available to the end user that are compatible with Epson Printers and smart devices. You will find a short description of these below. 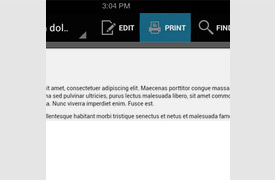 Built into Android 4.4 or later, you no longer need a separate app to support printing. 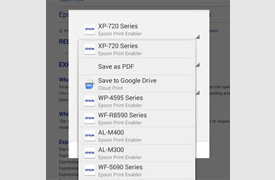 Following a download of the free Epson Print Enabler, just find the Print option within the Menu icon of supported apps. Integrated into Chrome, Gallery and Gmail, you can conveniently print web pages, photos and emails. 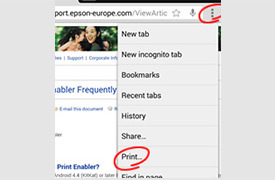 You can also access Android Printing from both Drive and Quickoffice so you can easily print your documents. 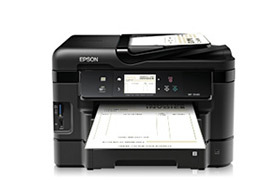 Most Epson Wi-Fi consumer inkjet (and some laser) printers available since 2008 will be compatible with Epson Print Enabler. See below for a list of compatible products. 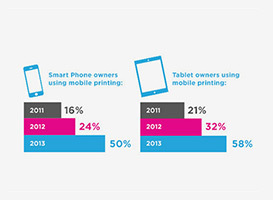 Keep printing when you switch from a PC or laptop to a smart device. 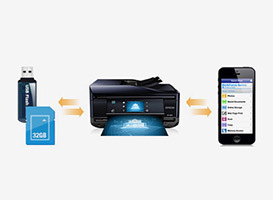 Epson printers are Google Cloud Print™ ready so you can print on the go from your smartphone or computer using Google Cloud Print enabled apps. 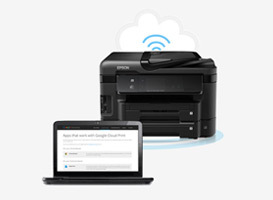 Print to any Google Cloud Print ready printer on any web-connected device. Now you can print an article you are reading on your phone so it is ready when you get to the office. 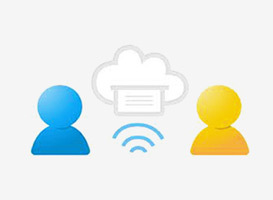 Share access with anyone you choose with a single click, directly from your Google account. This makes it easy for friends, family and other guests to print something while visiting. 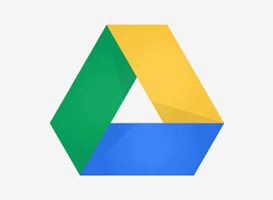 Print to Google Drive and take your documents anywhere you need to go. Wirelessly print documents, photos, emails, events and contacts from your Kindle Fire HDX - and select HD tablets - allowing you to get work done whether at home or in the office. 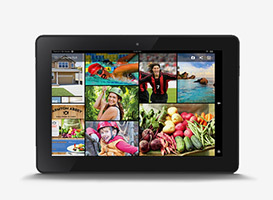 Your Kindle Fire will discover nearby printers automatically, making printing easy and simple. Kindle Fire comes preloaded with OfficeSuite to view and print Microsoft Word, Excel®, and PowerPoint® files when you're away from your desk. 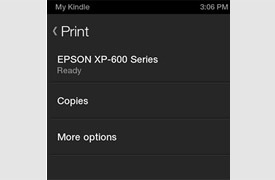 Printing is integrated into the Email, Calendar and Contacts applications in the latest Kindle Fire tablets. Whether you need a photo for your desk or for the wall in your home, the all-new Kindle Fires support printing from the Photos application. 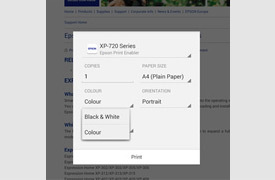 A standard that can work with all printer brands is the first step towards mobile users having the same simple print experience on any mobile device or operating system. Developers no longer need to support multiple standards from different printer manufacturers. Instead, they can use a single Mopria standard that supports printers from all brands. By developing a single standard, printer and device manufacturers can focus on new features and services to reinvigorate the entire market to the benefit of all customers. 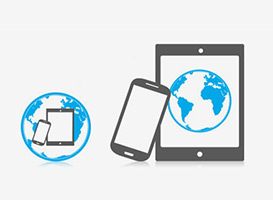 Worldwide shipments of smartphones will reach 1.6 billion by 20173 and by 2015, tablets will outship notebook and desktop sales4. By 2020, it's also estimated that 50 Billion devices5 will be connected to the internet. A uniform Mopria standard should help overcome any barriers to mobile printing, encouraging users to print from their mobile even more. 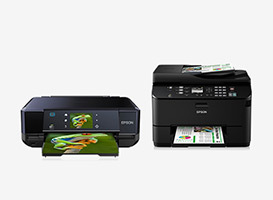 Epson Print and Scan delivers an exceptional print and scan experience in the Start screen for your Wi-Fi connected Epson All-In-One printers on Windows 8 so you can get your work done! The Epson Print and Scan app provides you with familiar basic control that are enhanced for touch to compliment your creativity. 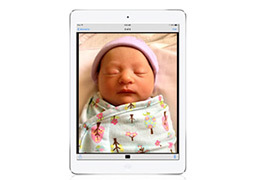 Print directly from your iPad®, iPhone® or iPod Touch®. There's no software to download, no drivers to install, and no cables to connect. 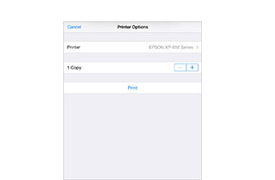 With just a few taps in Mail, Photos, Safari, or iBooks, you can send whatever's onscreen to an Epson printer. 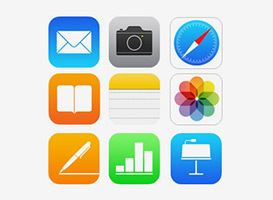 You can print from many of the apps you use everyday. The print function is only a few taps away. 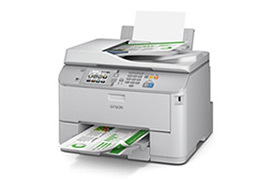 Print your emails, photos, maps, documents, spreadsheets and presentations to a nearby Epson printer over a Wi-Fi network. It's that easy. Use the "Action" or the "Tools" Button to find the print function. Then find the Epson printer on the Wi-Fi network and print. 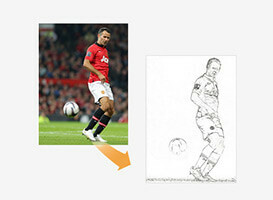 AirPrint takes care of the printing in the background. It's built into iOS so there's no printer software or cables to connect. Need to stay productive while on the go? 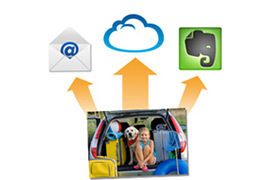 Easily print documents to your friends or families printer from your tablet or smartphone so they arrive before you do. It's quick, it's easy and productive. Just pick up your smartphone or tablet and you'll immediately be printing, scanning, copying and much, much more. 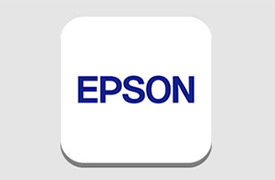 Print anytime to an Epson printer from practically anywhere using your smartphone or tablet PC - Epson iPrint makes it really easy. Just download and install this great free app and you’re ready to print web pages, Microsoft Office documents, photos and PDFs as well as Scan and Copy. You can scan old family photos and household documents to Cloud services for safe-keeping, or send directly to friends and family. 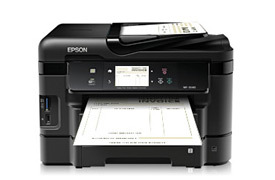 Use an Epson printer to scan your file and upload it to your online storage or "Cloud" account. Express your creativity using your smartphone or tablet with the Creative Print app. 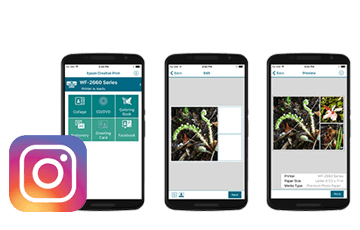 It makes it easy to print photos from your smart device, Instagram or Facebook. Plus, you can create collages, customise greeting cards, personalise stationery, print directly onto CD/DVDs and turn your photos into a fun colouring book. Facebook Printing has never been easier. Just log onto your Facebook account and you can print a 4x6 photo. Helpful when you need a print for a relative still not on Facebook or if you want to display a photo on your desk or wall. Build collages using photos from compatible social media apps as well as any other photo stored in your tablet or smartphone. Print in a variety of sizes, up to 8.5”x 11”inches (22x28cm). 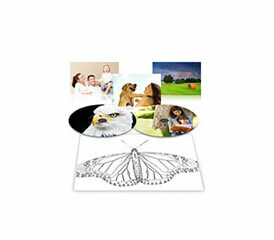 Create artwork from your photos and print directly onto an inkjet printable CD or DVD using a compatible Epson printer. Choose a photo and create an outlined colouring book that you can print and give to your kids to colour as a fun activity. 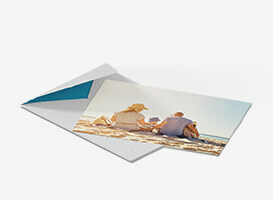 Make a bespoke greeting card using your photos. You can even personalise it with your own handwriting. One Microsoft Office 2010 or 2013 license needs to be installed on the server - not provided by Epson. 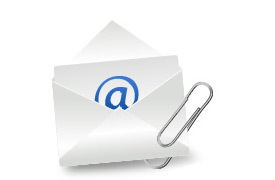 Please enter some details to download the FREE 60 day trial version of Email Print Enterprise.